Nautical by Nature: Anchors + monogram = I am in LOVE! What pretty finds! I love all of the fun colors!!! So cute! I love the bows! Those are adorable.. I really want to order the dog treat jar! the lobsters with stripes are pretty freaking cute. So cute! 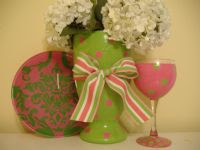 These would be too fun to drink out of. I was in Filene's Basement in Friendship Heights this past weekend and guess what they have there... Vineyard Vines! I had to share with you because I thought you'd like to check it out. BIG savings on items that are usually very expensive. You *need* some of these items Kate! Not just want, but *need* them. Yep. Grins & Giggles for your Thursday! I am so glad you posted these! I've started looking for 21st bday gifts for several friends and these are great! 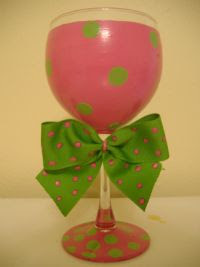 I have several glasses by J Bee and I adore them! Things are even cuter in person!! 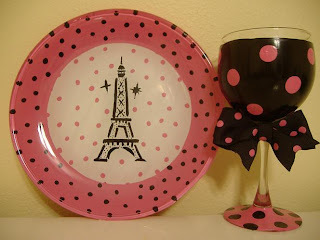 Those are all so adorable, I love painted glass. 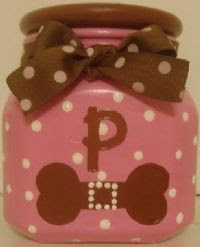 And that cookie jar is fabulous--I've been looking for a cute one! I'm salivating over that dog treat jar. Well, not really salivating myself, but you know, on behalf of my dog. Right...sense making is not my bag tonight. oh my gosh! 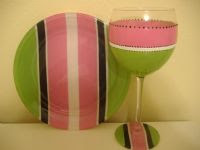 that pink and green stripy plate! flipping!! hope everything is good and that you are doing well! Adorable! I've always wished I could paint on glass like that. You seriously find the cutest online stores! I love them!!! 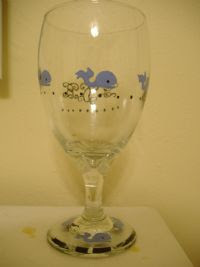 I adore the starfish glasses!